This post is for the purpose of defining the testing protocol and explaining the choices behind the equipment being selected for an upcoming wind tunnel test at A2 in Moorsville, NC on Wednesday the 19th of April. This test is part of a GoFundMe campaign started Friday, April 14th. Please consider donating. If you can't donate then please 'like', 'share', 'retweet', to help the cause. Tires and wheels are always a hot topic and I am looking forward to finding the fastest combination of tires and wheels for Ironman racing. The tires for the test are the Vittoria Corsa Speed and Continental Supersonic. All tires and wheels are rim-based clinchers. I have selected three wheels including: HED JET+ 6 Black, Specialized Roval CLX 64, and Enve 7 SES. This is wheel-only testing, but wheel-only testing has been shown to be a good representation of how the wheel performs in a bike. The equipment was selected based on a variety of factors, but careful thought has been put into testing the equipment that could yield the fastest practical result without compromising safety. Recently, Vittoria has released the Corsa Speed which has been 2x independently tested to be the fastest rolling tire. It is also a tubeless compatible tire and can be used without a tube and sealant instead. Its 23mm width is smaller than the 24mm Specialized Turbo Cotton yet rolls much better - likely due to the elimination of a puncture protection strip. In addition, the lip of the tire tread to casing combination may be thinner. It is believed that part of the poor aerodynamic performance of the Specialized Turbo Cotton could be explained by the pronounced lip of the tread to casing. Reducing the size of the lip could improve airflow over the transition. The shape of the tire inflated and width could also play a significant role, but this test aims to see how the Corsa Speed performs aerodynamically. The Continental Supersonic was selected for its superior rolling ability as determined by independent testing. It has been shown to have better aerodynamics than traditional cotton-based open-tubulars like the Vittoria Corsa Speed and Specialized Turbo Cotton. In the past, the tire was 23mm wide but measured narrow. Continental has recently introduced a NEW slightly wider version of the tire using a similar casing width and tread pattern to the Continental TT. The Continental TT tire also rolls fast and I assume the only difference between the two is that the Supersonic lacks the puncture strip. Presumably the Supersonic rolls even better given a wider width but it hasn't been tested as far as I know. In conjunction with this test I will reach out to independent tire testers to see if they would be willing to test the tire. One false belief regarding the Supersonic is that it is "fragile" due to the lack of a puncture protection strip. Riders using the tire have experienced very little issue with the tire. I myself have used the 23mm Supersonic in 25+ Ironman 70.3 and Ironmans with success. TJ Tollakson has used the 20mm Supersonic with success. In my opinion athletes suffer from an irrational fear of flats and often choose tires like Gatorskins when in reality they could ride a faster tire, have a flat, change it and still come out ahead of riding Gatorskins. The HED JET+ 6 Black wheel is a 60mm deep wheel that features a black textured aluminum brake track. It looks like a full carbon wheel, but the wheel is an aluminum wheel with a carbon fairing. It is 18 spokes, 719 grams and has an internal rim width of 21mm. For comparison, the internal rim width of the Zipp 404 and 808 Firecrest is 16.25mm. The textured brake track offers superior braking in both dry and wet. The braking is so powerful that there was an adjustment period for me in getting used to them. Previous muscle memory from the Roval CLX 64, Enve 7 SES, and various Zipps, had me almost throwing myself over the handlebars from sheer stopping force. 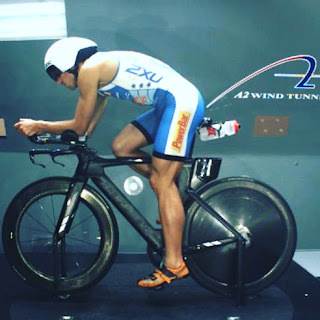 Although the JET+ Black tested fractionally slower aerodynamically against the Roval CLX 64 in the Specialized wind tunnel with an independent observer. The tire tested was a Specialized tire which the CLX 64 was designed around. While the HED Jet+ is a wide rim, the maximum width of the wheel is not that great compared to the ENVE 7 SES and Roval CLX 64. The Specialized Roval CLX 64 has shown based on independent testing to be a very fast rim. It is 64mm deep, 16 spokes, and weighs 695 grams. Given Specialized has the ability to design and test wheels in their own very wind tunnel you would think they had all the opportunity to produce a fast wheel. The wheel uses a wide-rim, both internally and externally (20.7mm). The rim is also fairly easy to mount tires to. Use of the Corsa Speed on a HED JET+ or Enve 7 make installation and removal of the tire extremely difficult. In a race situation with a flat you might struggle to change the tire. The Enve 7 SES is a 71mm, 20 spoke wheel with a 19mm internal diamater and 29 mm external width. It also has a textured brake track but is not nearly as effective being carbon as HED's. The average weight for two Enve 7 SES I have weighed is 754 grams. While Specialized and HED indicate that a 22mm tire is the fastest tire aerodynamically for their wheels, there are compromises to be made in comfort and rolling resistance with those tires. Enve claims the the 7 SES is designed around a wider tire so the wider 23mm tires of the Supersonic and Vittoria Corsa may close the gap and the wheel/tire combo may perform better. The Gofundme campaign, if fully funded, will feature at least 7 runs. Each tire and wheel combo will be tested. This is wheel only testing of front wheels so it will be a single sweep from 0, 5, 10, and 15 or 0, 2.5, 5, 7.5, and 10. Tires have to warm-up to deal with expanding nature of air/rubber and need to stabilize before collecting data. As a result it is estimated it could take 10-15 minutes per run. The tube may have different length valve extenders so as to best represent the possibility of the rim. The same two tires will be used across wheels. Raw data will be published and a summary of data will be prepared for easy readability and reference. Discussion if allowed will take place at Slowtwitch. Tires will be inflated to 85 PSI. Tire pressures need to be reduced with both wider tires and then again for the new wider internal rims. After talking with industry experts, other riders, and using wider rims for over a year myself, 85 PSI is an appropriate front-tire pressure for someone weighing 160lbs and will offer low rolling resistance, high comfort, and great handling. If the GoFundMe campaign is not fully funded then I personally will fund the remainder required to make this trip happen but in that case I may only test one wheel and the two different tires. Or one wheel and few more tires than two. I do have two HED JET+ 6 to utilize time better in this scenario. If the campaign is overfunded we may add other tires including Continental GP4000s, Continental TT, Specialized Turbo Cotton etc and keep the number of wheels at three. If you have any concerns with the protocol please feel free to comment below, private message, hit me up on Slowtwitch etc. Lastly, given the 16 hours round trip of driving I plan to do some of my own testing and tack on a few more hours. It is $1100 for 2 hours now and I will publish the results just as I did last year. Changes I will be making include incorporating Speedplay aero pedals, Trip Sockz vs 2XU compression sleeves, Kiwami LD Spider trisuit, LG aero trisuit, and Kiwami Tokyo Amphibian rear zip suit and testing the change from LG P9 to Giro Aerohead helmets. did you tested the Trip Sockz versus compression sleeves? I plan to buy Trip Sockz for Ironman, but not sure about the gain expected (worth if not allowed to swim with it?). I've just bought Speedplay aero pedals that are certainly very fast, but didn't test versus my old look keo or Shimano ultegra. By the way, your website is incredible, so many useful informations from a professionnel like you to us AG.